Here we will put up stories and news that we think may be of interest to our members, partners and supporters. There is an exciting opportunity for young Saxophonists coming up in February. 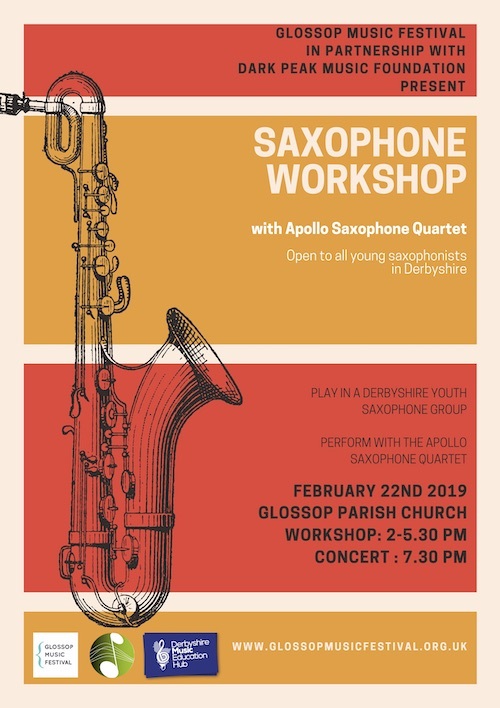 The renowned Apollo Saxophone Quartet will be performing in Glossop Parish Church on Friday 22nd February 2019, as part of the Glossop Music Festival. 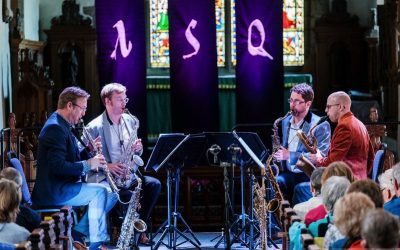 ASQ and the Glossop Music Festival, in partnership with the Dark Peak Music Foundation will offer educational and performance opportunities to Derbyshire sax players in advance of the concert. 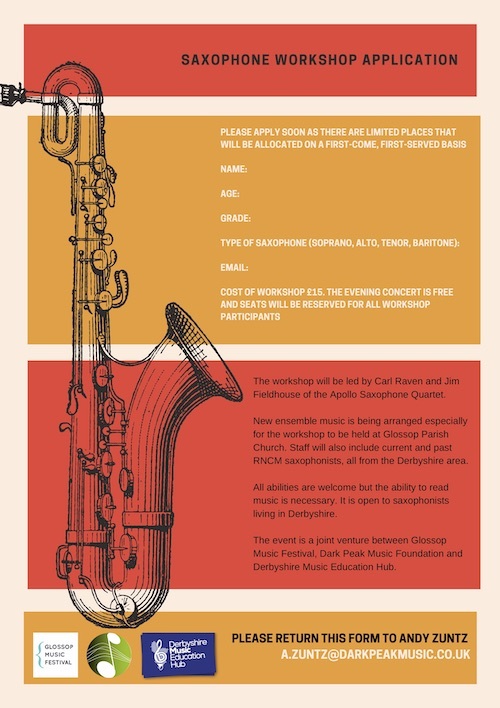 Two members of the Quartet, Carl Raven and Jim Fieldhouse, will run a workshop in the afternoon for young Derbyshire sax players of all abilities. The aim is to create an ad hoc Sax Ensemble to prepare and play specially arranged pieces. The pieces will be performed before the ASQ concert in the evening to the full audience. Students from the RNCM Saxophone Department will support the event. 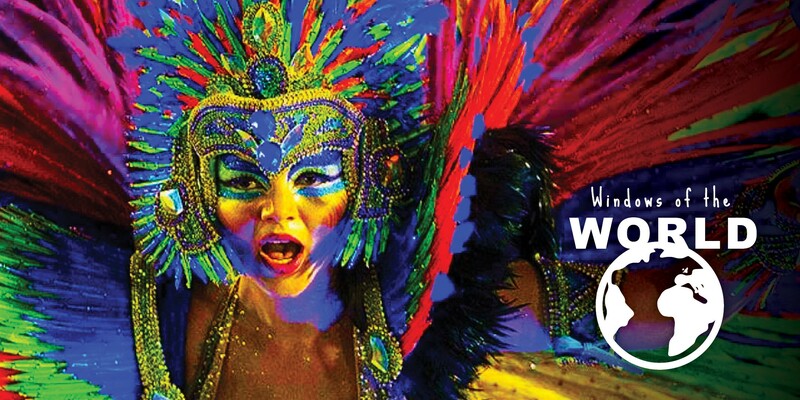 The workshop will consist of two sessions of rehearsal running from 2pm until 5.30. Refreshments will, of course be available. The event will include rehearsals and ensemble playing and there will be ample opportunity for one-to-one advice throughout. The players will then perform their pieces before a full audience at the evening’s concert, and have reserved places, free of charge for the remainder of the performance. We believe this is a wonderful opportunity for young players of all abilities to get some first-class tuition, meet professional players and conservatoire students and gain experience of live concert performance. Places are limited so please do spread the word and encourage young sax players of all standards to get in touch. Don’t miss a great start to the year with a terrific concert in our continuing Inspire Series. Come and listen to the music of George Gershiwn and Cole Porter played by local professional musicians. 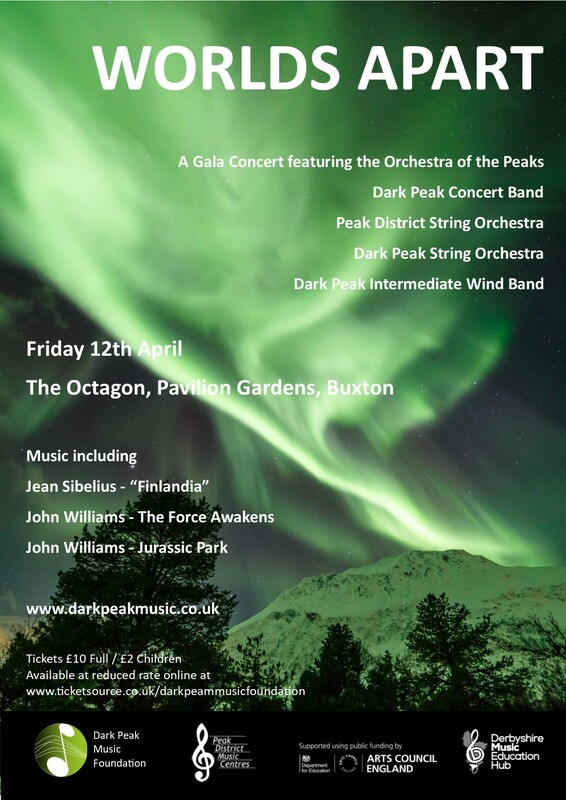 The Dark Peak Inspire Series was launched two years ago to promote special events including professional concerts, masterclasses and workshops, extending the work of the music centre beyond our core activity. 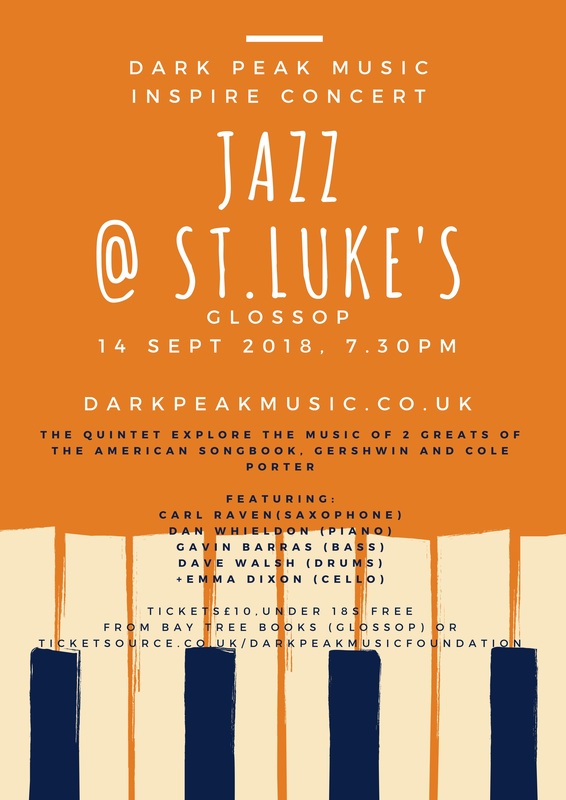 We are delighted to be presenting the third of our professional concerts at St Luke’s Church Glossop, at 7.30 on 14th September 2018. This autumn we welcome Carl Raven (saxophone), Dan Whieldon (piano), Gavin Barras (bass), Dave Walsh (drums) and Emma Dixon (cello). 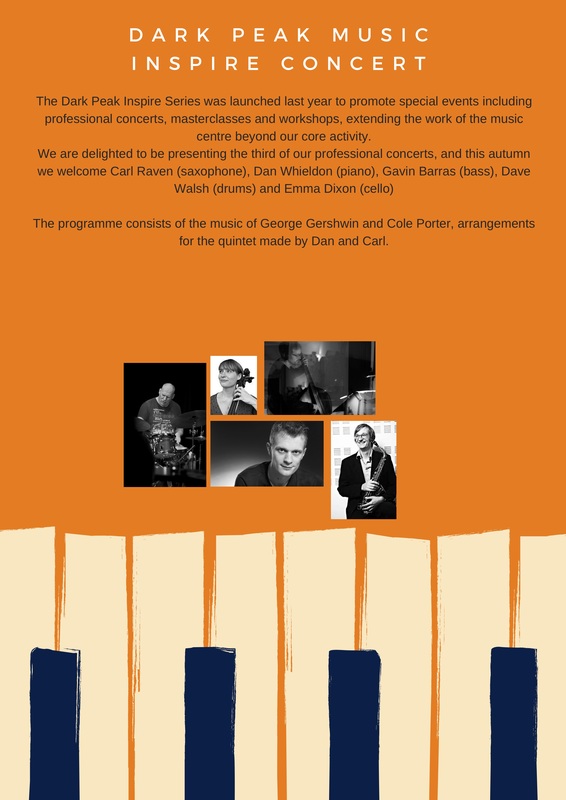 The programme consists of the music of George Gershwin and Cole Porter, arrangements for the quintet made by Dan and Carl. Be sure to book early for this inspiring concert! Please forward this information on to your friends and family. Please contact a.zuntz@darkpeakmusic.co.uk if you would like to help publicise this event we have flyers and posters to display and distribute. It was an early start for 60 members of the Concert Band and Sinfonia as they boarded a 90-seater luxury coach bound for the Veneto region of Italy. But the party was soon in full swing as the group departed on their 30-hour journey to one of the most beautiful areas of Italy. The tour was organised through Specialised Travel Ltd, and we were treated to a 4* hotel, excellent meals (the best being in an amazing open-air restaurant outside Lavarone) and well publicised concerts in great venues. The group gave two concerts in stunning venues high in the Dolomites, one in the beautiful Alpine town of Lavarone and the other in the magnificent cathedral in the spa town of Asiago. Both concerts were packed with locals and holiday makers who gave a rapturous welcome with standing ovations for both concerts. The Duomo in Asiago was particularly impressive with the audience packed to the very back of the cathedral. 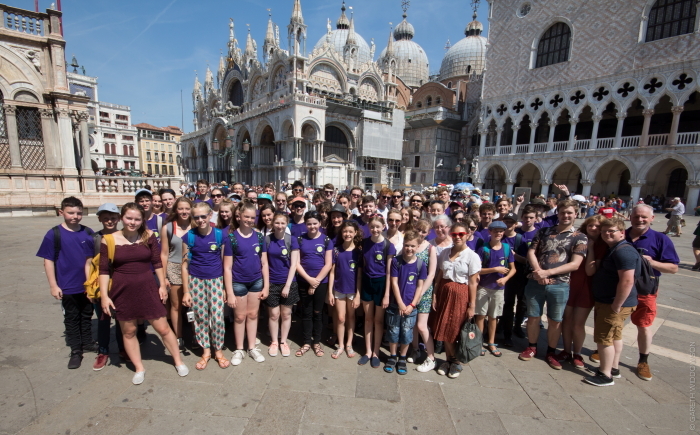 As well as the concerts, the young musicians had the chance to visit Verona, the setting for Shakespeare’s Romeo and Juliet, visiting the very balcony which was said to have inspired the story, and the amazing city of Venice, taking in Saint Mark’s Basilica and the Doge’s Palace as well as having time to explore in small the groups. The group learnt about the powerful family dynasties that ruled the different regions of Italy in the renaissance period, and the rise of the great Venetian Empire from the swamps of the venetian lagoon. They had a taste of the great cultural, musical and artistic developments in these cities as well as being able to explore and soak up the special atmosphere of Venice by night. The tour alternated between the sweltering heat of the Italian plain and the fresher climate of the Alpine uplands, with some impressive coach journeys with stunning Alpine scenery and hair-raising mountain roads (expertly negotiated by our superb drivers Ken and Sean). The group had a very wide age range, with a substantial group of players from the Intermediate Wind Band joining us. The initial plan was to include some repertoire specifically for their ability level, but in practice they played everything, even the most advanced wind band classics. Our team of 8 staff, which included two ex-members of the music centre now studying music, ensured that everything ran safely and to plan with suitable activities for all age groups. 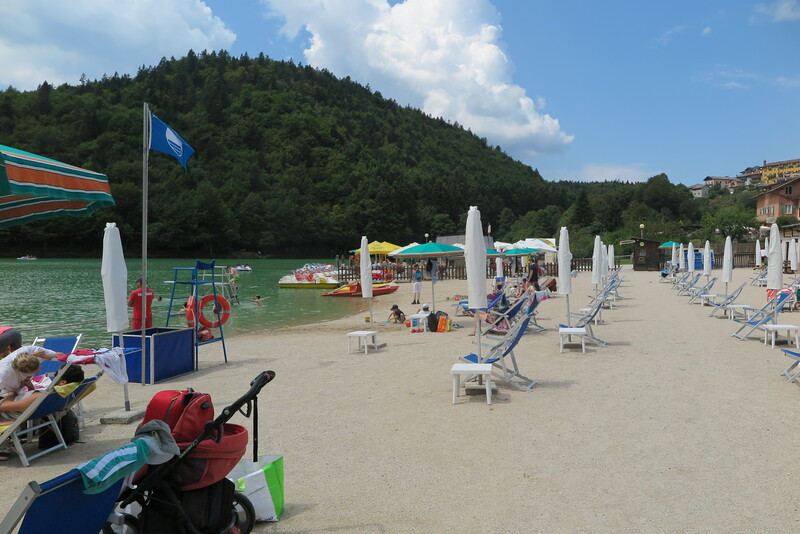 But the highlight of the activities had to be swimming and boating in the lake at Lavarone, surrounded by mountains. The now infamous “Pedalo” race in the lake was captured on film by our resident photographer Gareth Widdowson. All the official pictures of the tour by Gareth are available on our Flickr gallery via the website and plenty of other pictures are shared on the Facebook page. The Music Foundation runs international concert tours every two years and it has become a major part of the life of the music centre. We’re already looking forward to the next tour which we hope will be to Poland in 2020. Our now traditional Summer Concert and Garden Party on Sunday 24th June, 4pm in the delightful setting of Old Glossop Parish Church of All Saints. Join us for our traditional end of year celebration featuring the Concert Band, Sinfonia, Intermediate Wind Band and Chinley and Glossop Junior Bands. With music ranging from Bizet’s Carmen Suite to Holst’s masterpiece for wind band the Suite No.1 in F, and also including a “Film-night Spectacular” from our junior bands, it promises a fun packed end to the year. As we bid a fond farewell and bon voyage to our leavers, many of whom have been with us since they were primary school age and are now going on to further education, we also welcome new players who have joined since Christmas for their first concert. It is also a chance to give awards for outstanding achievement and contribution to the music centre throughout the year. 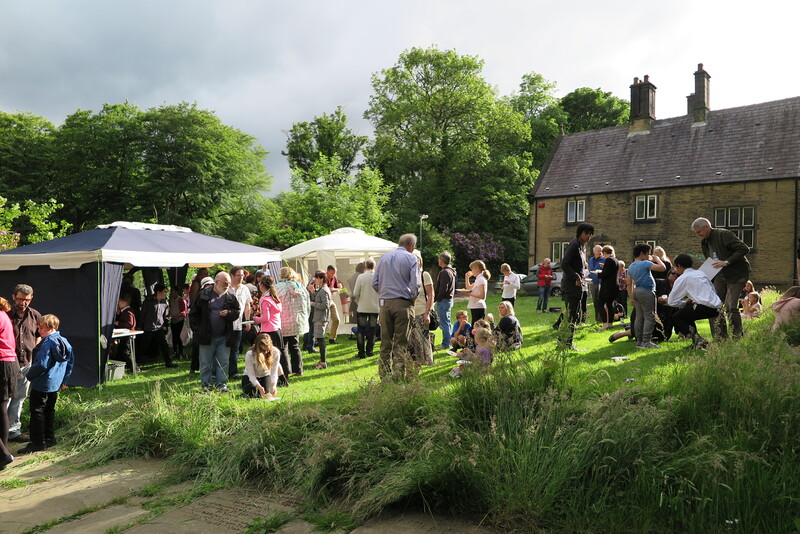 We hope everyone, children, parents, gradparents and friends will join us for food and drinks outside (weather permitting) on the green….. a thoroughly pleasant finale to another highly successful year for Dark Peak. This is a very popular event and seating is limited so we strongly recommend getting your tickets in advance. There will be some standing room, but we don’t want anyone dissappointed. Tickets cost £5 full/ £1 Children and can be purchased online using the link below. 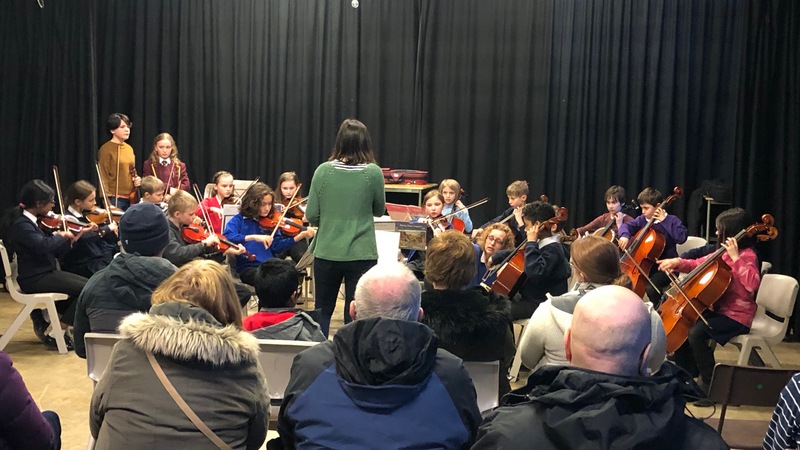 The Strings Concert features the Junior, Intermedaite and Senior Strings Orchestras, concluding with a mass performance from all the players. We hope parents and friends will come and support all our young players, many of whom will be taking part in their very first concert. Dark Peak Intermediate Wind Band achieved a Gold Award at the national final of the NCBF at the Royal Northern College of Music. 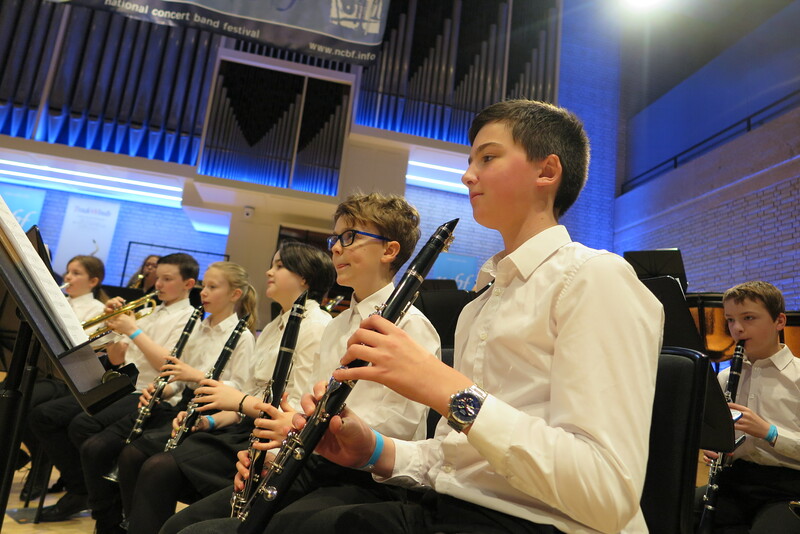 It was an early start for the Dark Peak Intermediate Wind Band who were performing at the national final of the prestigious National Concert Band Festival, one of the biggest festivals of its kind in the world. The invitation came following their successful appearance at the regional festival in November and the players were determined to give their best ever performance … and they certainly did the music centre proud, impressing the adjudicators Gererd Booth and Simone Rebello, who commented particularly on their confidence, ensemble skills and superb section work. Opening with a lively flamenco dance “La Caracola” they moved onto an evocative tone poem “The Painted Desert” both by Philip Spark. After a foray into the world of film music with “The Great Escape” they concluded with a rousing finale “Celtic Air and Dance” by Michael Sweeney. The music centre was represented this year at NCBF by our younger ensemble, with an upper age of 14. And judging by the amount of talent and commitment on display we have great things to look forward to in the years to come. 60 members of the Dark Peak Concert Band and senior string ensemble will be donning t-shirts and shorts and heading for the beautiful Veneto region of Italy from August 18th to 25th. The tour will include concerts in the historic spa town of Asiago and the Alpine town of Lavarone with its mountains, woodlands, meadows and lakes. 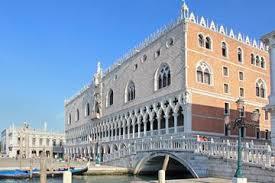 The trip will also include full day excursions to two of Italy’s most iconic and culturally important cities, Venice and Verona.